How do you create a mission-critical website providing exceptional performance yet at the same time being flexible, reliable and scalable? That's the question that Kyle Loudon, a software developer and manager of a user interface development group at Yahoo!, sets out to provide the answers to in his book: Developing Large Web Applications. Sub-titled 'producing code that can grow and thrive' Loudon has adopted a practical approach to developing large web applications that remain effective as they scale up in terms of features, functions and users. His past experiences, including developing a flight planning system that's used by airlines worldwide and teaching object-orienting programming at the University of California, Santa Cruz, have come together in these 279 pages. Not only in the obvious depth of knowledge displayed by the author, but perhaps most importantly in his ability to communicate this clearly and concisely. As Nate Koechley, Frontend Engineer and Designer at Yahoo!, so aptly puts it in his foreword "Build big by thinking small. Build new by thinking old. Manage scope. Boost signal and reduce noise. Resist breakage... these things are easy to rattle off, but it takes an author like Kyle, and a book like this, to make them practical and real". :) O'Reilly technical books always have some animal on the cover. No rhyme or reason to it that I've ever figured out. I like that Mr. Loudon covers peformance and application architecture and that the principles can be applied to smaller applications. 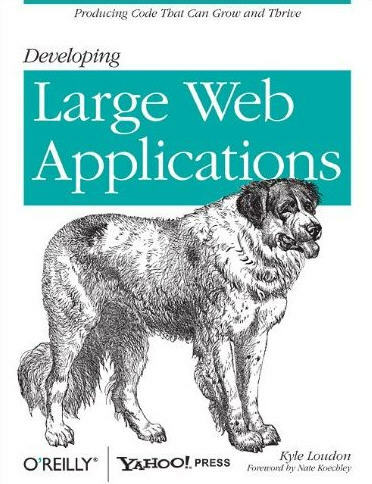 As for rhyme or reason to the cover of the book, I think the big dog represents big web applications.